When you or your supporter pastes a link into Facebook, wouldn't it be cool if the link went onto their timeline with an icon and text that you write? This article shows how to do just that and suggests a way to manage the the Facebook OpenGraph <meta> tags that make the fancy stuff happen. If you want to put OpenGraph <meta> tags into your template Right Now and don't have the time to read this article, then you can use this page. Come back to this article when the emergency is over to learn more about how to manage those <meta> tags. SalsaScript experience is very helpful. This article contains SalsaScript that needs to be modified by the campaign manager. An experienced campaign manager will find this article very challenging. This article contains samples that are customized for my actions. Copying and pasting the samples without modifying them will not work. This article contains SalsaScript. It is relatively easy to make a big hash of your template if you make a mistake. Copy and paste carefully. If you find that SalsaScript is outside of your scope, then (1) stop and (2) send an email to developers@salsalabs.com to get help. For best results, please read the links in the Background section. Details about the OpenGraph meta tags can be found on the Facebook OpenGraph Developers site. There are tons of other sites on the web that offer examples and advice about using OG tags in your website. However, if you just need a quick summary of the OG tags and what they do, then this is a great site. <meta> tags can be overwritten. If you have two og:title meta tags, then the second one wins and the first one is completely forgotten. After doing this for a bunch of action and donation pages, the end result will be lots and lots of single-use templates -- a management nightmare. If you needed to assign a template Right Now, then you would have to scroll through tons of templates, most that look exactly alike, to find the template that you need. 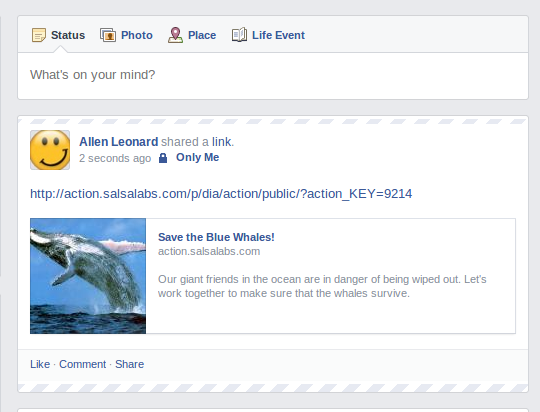 The solution is a single template that contains all of the Facebook OpenGraph tags for all actions. The template would figure out which page is being used, and the supply the OG tags for the page. To sweeten the deal, if the template is assigned to a page that does not need meta tags, then it would behave like a normal template. The rest of this article shows out to build a template that does just that. Let's start by using an action page that has working OpenGraph <meta> tags in it. Please click here to view the action. It's not much of an action on purpose. Please refer back to this example if you have any questions about how the metatags probably should appear for a Salsa page. A template to host the OG <meta> tags for one or more actions. Actions, events or donation pages that you need to publicize on Facebook. Use these steps to set up the SalsaScript that will manage your OpenGraph tags. This needs to be done only once per template. When you are done, the template will load exactly the same as before. You can confirm this by viewing a page that uses the template. Locate the <head> tag in the template. Insert a blank line right after the <head> tag. Click here to see the page where the script lives. Click the Raw button. A window will appear that contains just the script. Paste the script in the newly created line in the template. Now the template has the framework that it needs to support OpenGraph <meta> tags for as many pages as you'd like. Use the next step for each page that will have OG <meta> tags. This is the hard part of this article. If there is a mistake in the SalsaScript, then no permanent damage will be done, but your template will not display correctly. Please follow these steps carefully. If you find that SalsaScript is outside of your scope, then go to the Questions section at the bottom to get help. The KEY for each page. The KEY can be found in the browser's address bar when you edit the page. The OG <meta> tags that you want to include for the page. There's some excellent documentation here that can help with that here. The code in the one-time setup examines the page URL for one of the standard page types (action, donation, etc.). If one is not found, then no OG <meta> tags are added. Next, the code looks for a match on the KEY value (that is, the KEY value matches one of the KEYs that you've configured). If that happens, then OG <meta> tags are not inserted. If there are not OG <meta> tags for the page type and the page key, then the template is not modified. Follow these steps for each of the pages that you want to equip with OG <meta> tags. Edit the template that needs OG <meta> tags. Locate the <head> tag using the browser's search tool. Insert a blank line immediately after the </head> tag. Click here to see the page where the SalsaScript that manages OG <meta> tag lives. Click the Raw button. A window will appear that contains just the SalsaScript. Paste the copied content into the newly inserted line in the template. action "Insert your action OG meta <tag> 'case' statements here." donate_page "Insert your donation OG meta <tag> 'case' statements here." event "Insert your event OG meta <tag> 'case' statements here." When you've located the right place to insert the 'case' statement, then paste it in. Note: The apostrophes are important. Change the <meta> tags to have your content and your copy. Now that you've seen a sample, you should be able to modify the OG <meta> tags to meet your needs. If you need help, the use the OpenGraph documents mentioned in the first part of this document to make sure that you are providing the correct information and the correct format. Please remember that Salsa does not provide support for OpenGraph content. If you have problems with the <meta> tags themselves, then please contact Facebook for support. Facebook has an excellent debug page that can help you get your OpenGraph meta tags in order. Click here to use the debug page. Here's a checklist to use before you test. These are the common mistakes that everyone makes, so you should be on the lookout for them. Back up your template before you change anything. Make sure that you've copied and pasted carefully. The <meta> tags must appear between the <head> and </head> tags in the template. Make sure that all of the quotation marks are matches. To make this easier, do not use apostrophes ('). Only use quotes ("). Make sure that you do not have curly quotes in the pasted material. Use standard, boring vertical quotes. Use two minus signs as a dash. Do not use the dash on the Mac keyboard. Do not use the short dash on the Mac keyboard. Use a single minus sign instead. Use images from your Salsa HQ for og:image tags. This will avoid cross-site complexities that are tough to figure out. Test each of the pages that you add before you add another. and send us a message. We'll be glad to help.